Are you looking for: On The Go Baby Dome (Afterpay available), Laugh and Learn, Activity Gyms. No one knows children and their toys quite like Fisher Price Toys. This is the trusted name in baby and preschool toys. Fisher Prices Toys start out with simple toys for babies and grow with children to include a range of electronic toys. Our online selection of Fisher Price Toys includes the Fisher Price Activity Walkers for toddlers learning to walk. Older tots will enjoy the digital Fisher Price Smart Table that introduces them to digital concepts. 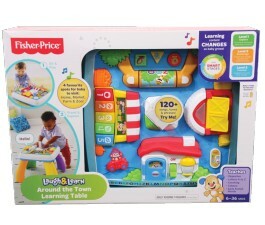 Fisher Price Toys are great learning toys with fun activities for bath time, outside play time, role playing, and more. Shop online today and let Mr Toys Toyworld save you time and money.